Continuing on with the 2011 NFL Draft, and the selection of the Arizona Cardinals. We left off the last post with the first three Cardinal picks of the draft, so we begin this post with the fourth round pick. Let’s see how the Cardinals fared in the remainder of the draft. Keep in mind, up to this point the Cardinals have selected a cornerback, running back, and tight end. Their biggest needs are quarterback, offensive line, defensive pass rush, tight end, and linebacker. They have basically filled one need so far with their top three picks. The Cardinals finally get their pass-rushing linebacker in the fourth round, but he is a big question mark in my book. This year’s draft was pretty weak in regards to the depth of linebackers, and there were really only three that were in the top-tier. If the Cardinals really wanted an outside linebacker, they probably should have chosen one in the second round, no later than the third round, as they would have been able to select Justin Houston or Martez Wilson at that point. 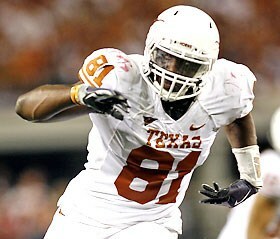 Acho is a competitor, a fundamentally sound tackler, and he has great character. His downside is that he lacks explosion off the line and does not run well in the open field. He doesn’t always react quick enough to counter plays and draws. He is considered a “tweener” because he does not possess the bulk to stand up against the run, and he is not quite athletic enough to play linebacker. It will be interesting to see what the Cardinals do with him and how they utilize him. With outside linebackers Joey Porter and Clark Haggans both being 34 going into this season, their best years are probably behind them. 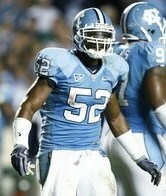 Porter, going into his 13th season, was ranked 97th in total tackles for linebackers with 50. Haggans was even worse, ranking 100th with 47 total tackles as a starter. Both players ranked 18th in total sacks, as they both had 5 last year. Their backups were a rookie and another player with one year of experience, so the outside linebacker positions should be wide open for anyone who wants to take them, including Acho. Again, this selection puzzles me, since according to most draft experts, the Cardinals big need in the draft was not a fullback. I am not sure how Anthony Sherman fits into the big picture for the Cardinals, as many experts saw him coming into the NFL as an undrafted rookie free agent. The only positive thing you can say about him is that he is tough, can pass block, and he may have an impact on special teams. He has a much greater downside, as he does not have the lower body strength to push defenders down field, he misses blocks at times, he does not have good vision or speed to find the running lanes, and he is not effective in the passing game out of the backfield. Scouts have said that Sherman does not have the strength to be a lead blocker in the NFL, and he runs a 4.75 40-yard dash. The position of fullback in the NFL has pretty much been turned into a smaller moving offensive lineman. There are not too many teams that put much emphasis on this position being a running or receiving option. Fullbacks are mainly used as a blocking back in short yardage situations. The Cardinals already have three fullbacks on their roster, and because this position is hardly used, it seemed a waste to draft another one. Consider the fact that the starting fullback for the Cardinals last year had 0 rushing attempts and only 2 receptions. Now the Cardinals have four players to choose from, for a position that is hardly even used. I think I would rather have four offensive tackles or four defensive ends to select from to make my team better. This was actually a steal by the Cardinals. Sturdivant was slated to go in the 3rd round of the NFL Draft, but a hamstring injury and character issues dropped him lower in the draft. He is just what the Cardinals need at linebacker. He is athletic, reads and reacts quickly to fill holes, is a solid tackler, and has the speed to cover backs and tight ends man-to-man. He was definitely the highest ranked linebacker left in the draft. He does lack the strength to shed blockers easily, and can get lost in traffic. He is also not the best in open space, but overall a great pick up in the 6th round. Quan Sturdivant may not be a starter for the Cardinals at linebacker for a couple of years, but he should be ready when they need him. Although Paris Lenon had 125 tackles last year, tied for 10th highest in the NFL for linebackers and the most ever in his career, he will be turning 34 during the 2011 season, and he won’t be able to play at such a high level forever. The Cardinals other starting linebacker, Daryl Washington, was a rookie who had 78 tackles and should be a staple in the Cardinals defense for several more years. After a few years of grooming, Sturdivant could end up as a nice replacement for Lenon when his time is up. The Cardinals finally select their first lineman, and it’s on the defensive side of the field. I think that the Cardinals are sort of taking a chance on Carter because they liked his size and athletic ability. There is not a lot of risk involved with the 6th round pick, but if he pans out, there could be great reward. Carter has a good burst up the field, and has the strength to disrupt the running game. He has shown flashes of real NFL talent, but does not always play up to his potential. He did not start in college until his senior year, and it would be a stretch to consider that he will have any immediate impact on the team. Calais Campbell is entering his 4th season on the defensive line for the Cardinals, and he is only 24 years old. He registered 60 tackles last year which tied him for 11th among defensive linemen. His 6 sacks tied him for 28th in the NFL, but the Cardinals are going to need some more production out of him in this area if he wants to keep his job. In his 8th NFL season, and 8th season starting for the Cardinals, Darnell Dockett plays on the other end of the defensive line. Over the last 3 years, he has averaged 52 tackles and 5.4 sacks per season. Last season, his 52 tackles placed him 26th among defensive linemen, and his 5 sacks tied him for 39th in the league. These are not franchise player stats by any means. With Alan Branch as the only backup for both positions, Carter may be able to help give the starters some relief during games, if the Cardinals can find out how to motivate Carter to play hard 100% of the time. Overall, this was not a bad choice, but I would have liked to see the Cardinals go after a defensive lineman in the 1st round instead. 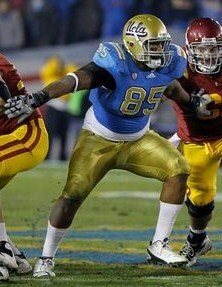 With their final pick of the 2011 NFL Draft, the Arizona Cardinals went with wide receiver DeMarco Sampson. He has the prototypical size a team looks for in a receiver. He can make catches in coverage, will find the openings in a zone defense, and will block down field. You can’t teach speed, and Sampson does not have the breakaway speed to separate himself from defenders at this level. He also does not possess the moves to get around defenders after the catch, and sometimes drops easy passes. He has had some injury issues in the past which hurt his draft status, but could work himself into a number 3 or 4 receiver in the slot. Larry Fitzgerald is the number one receiver, and Steve Breaston moved to the number two spot after Anquan Boldin left prior to the 2010 season. After that, the Cardinals had three rookie receivers backing them up. Breaston needs to step it up if he wants to remain the number two guy, as 47 receptions for 718 yards and 1 touchdown is not enough production. He was ranked 49th in receptions and 39th in receiving yards last year among all NFL receivers. Again, I am not sure that drafting another receiver was the way to develop your receiving staff, especially in the seventh round. I would much rather have preferred that the Cardinals drafted more linemen, both on offense and defense. Because the Cardinals did not draft one offensive lineman, I am hoping that they hold true to what they say, and they are very active in signing and trading players once the lockout has been resolved. Their number one priority still remains at the quarterback position, but they also need to shore up the offensive line. Overall, I would grade the Arizona Cardinals 2011 NFL Draft as a C+, because they did not fill a lot of needs, and a few picks were real questionable. I think they did well in selecting athletes, and picked the highest rated player in their respective position a few times, but that left a lot of holes still to fill. I am looking forward to the NFL labor resolution so I can find out what the Cardinals are going to do about their quarterback situation. ~ by Troy Erickson Realtor on May 4, 2011.